This is a relatively easy, tasty dish. I got the base recipe from a magazine a while ago. It’s a good one for dinner parties as you can cook the duck legs during the day and get the cabbage mixture started early and just finish off the cooking when you want to serve. 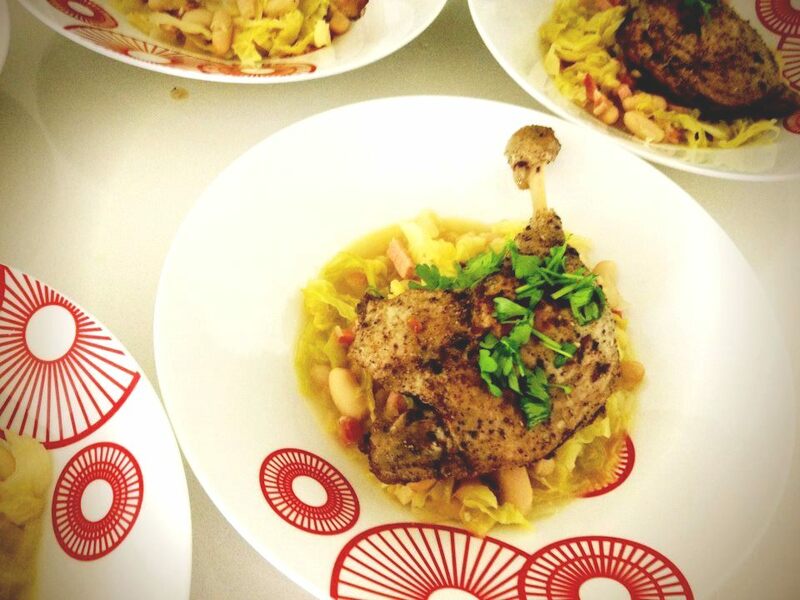 You should really start the night before by marinating the duck legs and soaking your cannellini beans. The trick with duck confit, and I’ve learned by mistake, is to get the oven temperature just right so there is only the slightest bubbling happening on the surface of the cooking fat. This means watching it closely during cooking. The temperature will very much depend on your oven. Recipes I’ve seen say around 150 degrees celsius but my oven runs pretty hot so after the initial few minutes, I reduce the temperature to between 60-70 degrees, and I just adjust the temperature slightly as I need to in order to keep that very gentle simmer. If you haven’t got time, rather than soaking and simmering the cannellini beans, you can always substitute for the canned version. You can buy tubs of duck fat in the supermarket these days, and you can use the duck fat again by pouring the cooled fat back into the tubs and freezing it. Combine the marinade ingredients in a large bowl and season with salt and pepper. Add the duck legs and make sure they’re covered in the marinade before covering the bowl and refrigerating overnight. The night before, place dried cannellini beans in a bowl and cover with cold water. Soak overnight. Preheat oven to 150 degrees C. Remove duck from marinade and pat dry with paper towel. Spoon duck fat into a large casserole or high sided roasting pan. Place over medium heat for 2 minutes or until fat is just liquefied. Add legs to the fat (the duck legs, not yours!) and ensure they are submerged. Bring to a simmer. Transfer the casserole to the oven and cook, uncovered for 2.5 hours or until the meat is almost falling off the bone. During this, watch the duck to make sure there is only the gentlest of simmer. Adjust oven temperature accordingly. Cool the duck in the fat to room temperature. You can use them immediately or refrigerate up to 2 weeks. Meanwhile, drain beans and place in a saucepan and cover with cold water. Bring to the boil then simmer for 20 minutes or until tender, then drain. Heat oil and butter in a large pan over medium to high heat. Add pancetta and cook, stirring, for 3 minutes or until the fat renders. Add the onion and garlic and cook for a further 3 minutes or until onion is softened Add cabbage and stock, bring to the boil then simmer for 25 minutes. Stir in the cannellini beans then season. Preheat the grill to medium high. Remove duck from fat, scraping off excess fat. Place on an oven tray, skin side up and grill for 6 minutes or until the duck is golden and heated through. Divide the cabbage mixture among bowls, top with duck leg and garnish with flat leaf parsley.